My Next Bike is the authorized Philippine representative of Jeff Jones Bicycles. We offer Jones framesets, hubs and handlebars - and can also process pre-orders and reservations. Lead time for orders is 8 weeks, subject to availability. Framesets are typically sold as a package, and include a Jones FR-135 front hub. Options include Jones Loop H-Bars, and special headsets for Truss forks. Color options are dependent on current stock. We can also assist you through the build and setup process, selecting from our inventory of Velocity rims, ESI Grips and Vee Rubber tires. A Jones is a high-performance non-suspended bicycle. The ride is both efficient and comfortable and the handling is immediate and assured. With the default choice for off-road cycling nowadays seemingly suspension before anything else it might seem odd to ride rigid but that is the last thing Jones bicycles are – the geometry and construction provide an extremely satisfying and direct connection between the rider, the trail and the bike. It's pure cycling and a lot of fun. Yes, there are brilliant riders with suspension technology truly exploring cycling possibilities. Pushing the envelope and all that. But this style of riding and type of bike might not actually suit everyone, whatever the adverts are telling you. Read the adverts carefully. A simple bike can be amazing...It’s delightful when all your steering, pedalling and subtle weight shifts make an immediate difference to your ride. Sure, it’s not for everyone, some people won’t want or like it, but for those who can appreciate this kind of riding and this kind of bicycle then a Jones is the very best bike available. It’s agile, precise, efficient and comfortable. It’s fantastic fun. It’s dynamic. The Jones geometry delivers a rigid bicycle that is anything but – frame and forks designed in harmony to deliver a pure cycling experience like no other. The high-performance, non-suspension, bicycle. Yes you can race it! 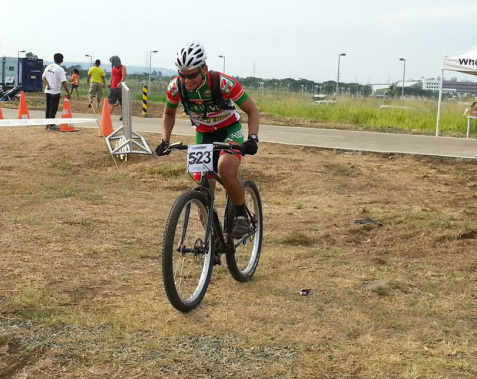 On the way to a 7th place age category finish at the Nuvali Dirt Weekend Invitational. Photo courtesy of Bruce Muñoz. "It's a high performance non-suspension bicycle... instead of designing the bike for XC-racing like so many unsuspended bikes I wanted this bike to be better for technical and distance riding... Since this bike is not designed around a suspension fork I'm able to do much more to improve the handling. By designing the frame and fork together and considering the larger wheels I'm able to make a bike that rides very differently to a 'normal' rigid bike (be it 26 or 29er) with a short rake fork. This is the Jones geometry (and superb handling) as a traditional diamond frame. This, being easier to build, costs less than the Spaceframe version, and while it doesn't offer the same compliance, the seat and seat stay tube dimensions have been carefully selected to both improve the ride and reduce the weight. Construction: The frame is TIG welded 4130 chromoly with a butted down tube. The cable guides and bottle bosses are brazed on. The latest versions have a clear powder coating, over the decals, on top of the tough powder coat paint finish for appropriately rugged good looks. A full range of frame-fitting bags are available for bikepacking and touring capabilities and the 4130 Cro-Mo Unicrown forks have custom mounts for the Tubus Duo low-rider racks. Steel frames have the same geometry, clearances, features, gearing options, handling and balance points as the titanium frames but at a lower cost, heavier weight and a different feel. The ride is similar to the ti frame (it has the Jones geometry after all) but it is different. It does feel vertically stiffer compared to the titanium Spaceframe but it's a very good, solid feel. It's steel and steel is good. The steel Spaceframe and Truss fork produces a ride that is stiffer than the titanium version but smoother than the diamond steel model. The tubes used can be smaller than the Ti version as steel is stiffer and this then allows the flex to be carefully managed to deliver efficiency and comfort. This is, currently, as good as it gets. The titanium Spaceframe and Truss fork deliver the rigid bicycle that is anything but. Laterally stiff to deliver the power with a vertical compliance that softens the ride? Yes, but this is only the icing on the cake. The Jones geometry ensures the best handling bike there is. It really does need to be ridden to appreciate it. Titanium, used here, provides strength, stiffness and compliance in a light, durable bike. The Jones geometry makes it all worthwhile. • The Forks are compatible with 135mm front hubs such as the Jones 135-F or Paul Whub (not 135mm rear hubs). • The forks all have clearance for 29x2.55", 29 x 3" (29+) and 26 x 4.7” fat tires. one singlespeed dropout insert and bolts. • Fork bolts, bottle bolts and the hanger nut and bolt are all stainless steel. • Truss forks include an aluminum steerer tube. • The Truss fork does not use a normal 'press on' crown race. • The Jones unicrown fork uses standard 1-1/8" headset. • Rear tire clearance up to a 29 x 2.5" on a 50mm wide rim.